“Racing Through The Dark” is an account of a life lived following a passion for cycling, including a detour through the dark side of professional cycling: performance-enhancing drugs (PEDs). Mr. Millar is one of the more gifted and intellectual riders in the pro peloton and has given great thought to the subject of PEDs. Along with several other formerly doped riders and team director Jonathan Vaughters, he has turned the Garmin team into a safe haven for up and coming riders. With all the current focus on Lance Armstrong’s confession to Oprah, the ongoing Operation Puerto trial in Spain, and the continued questions about the IOC-approved governing leadership of world cycling, the UCI, and it’s knowledge of and potential coverups of doping cases, this book is a must read. Millar was a naturally gifted rider from the beginning, ascending easily to the top of the amateur ranks in France and then to the pro peloton with Cofidis in 1997 under the guidance of legendary team director Cyrille Guimard. This was the team that had been built around Armstrong before his cancer diagnosis. He was soon to learn that being a pro was a much larger jump than he had imagined. And he was chagrined to learn also, in his first pro race, that a teammate was already being asked to dope by team leadership in their quest for results. He also soon learned about “recovery” injections of vitamins and iron supplements (both legal) and the new “health check” rule: EPO use was so widespread and yet still undetectable that the UCI decided to suspend anyone testing over 50% red blood cells for two weeks. He learned about preparation. Still, Millar persevered and achieved some success while remaining clean, including winning the 2000 Tour de France Prologue over Armstrong. Millar made the decision to use EPO after dropping out of that Tour de France in 2000 after suffering severe fatigue. He was then scheduled to ride the Vuelta in September, and given three weeks off to train with “L’Equiper” in Italy prior to the start. This was the period during which he would first take EPO. A good performance ensued, with Millar winning the Prologue to take the leaders jersey for several days, and then winning Stage Six. Millar again used EPO in 2003, prior to the World Championships in Canada, where he won the World Time Trial Championship. Millar was arrested in Biarritz in June, 2004 at a restaurant in Biarritz. He soon confessed and cooperated with the authorities, receiving a two-year suspension from June 24, 2004, ending a week before the 2006 Tour. Millar joined the Saunier-Duval team for the 2006 and 2007 seasons. In 2008 Millar and others, including several American riders such as Dave Zabriskie and Christian Vande Velde, joined together to create a team with a strong anti-doping culture. Together with director Jonathan Vaughters they formed Slipstream Racing LLC which became Team Garmin. Garmin has had remarkable success and spawned other “clean” teams such as Sky. Millar was also instrumental in getting the UCI to ban the injections widely used for legal recovery products such as vitamin and iron supplements. Cycling has a long history of a doping culture, with significant pushback only in the last several years. The current revelations of systematic by teams led by Armstrong, of the ongoing Operation Puerto trial, and the potential establishment of a Truth and Reconciliation Commission point towards a cleaner future. Truthful admissions by many riders and the recognization that sponsors will not stay in a dirty sport with repeated scandals will lead to stronger anti-doping regimen and result in younger riders not have to face that fateful decision of whether to dope or to leave the sport. 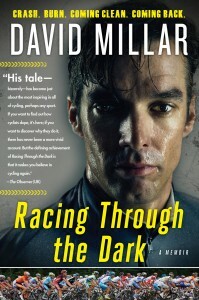 Millar has authored a well-written autobiography that reads easily and quickly. He delves into his upbringing and personal issues that affected his racing and general lifestyle. As one of the smartest and most erudite members of the pro peloton, one who has seen the Lance era come and go, I highly recommend this book for an inside look at the sport during the EPO era, and after.